We’d arrived too late to secure a camp spot in the park, however the nearby city of Moab had a plethora of private campgrounds to choose from. After consulting our handy Fodor’s guide, we soon were on our way to the recommended Slick(Shady)rock campground. It had all of the typical amenities: small grill, shade, restrooms, office wi-fi, pool, hot tubs, showers. We may not be in the park, but we’d be living in luxury and leave smelling like delicate desert flowers. For however long that lasts. We only had the one day in the park, so we made sure to wake up early to make the most of our time. Someone once told me that Arches NP is where you go to fall in love with the desert. Now, I’ve been living in the desert for over two years now and have only a mild toleration for an area that is mainly devoid of forests and streams. But, I wanted to give the desert another chance. As always, we stopped off at the visitor’s center for our trinkets and usual chat with the Rangers at the information desk. We’ve yet to be disappointed by the advice of the Rangers, and this morning Steven and Emma were not about to break that streak. Rachel and I usually try and have a basic idea of what we want to accomplish in a park. How far we want to hike (usually about 10 miles per day) and what sights we would like to see (arches and some bighorn sheep, please). 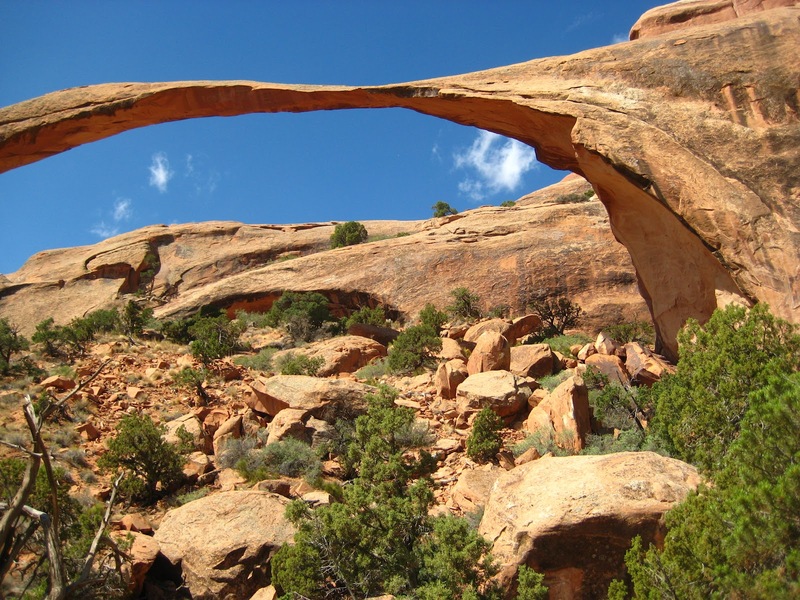 Steven recommend the full Devil’s Garden trail (with primitive loop), a restful afternoon out of the sun, a quick walk around Balanced Rock, and then to top it off with a sunset trip to the Delicate Arch. Emma was our go to for bighorn sheep questions. Where can we find them? Does she know where they are right now. Is she hiding them? Can she let them come out and play? We were informed that sheep sightings are still rare in the park, but to keep an eye out during the first three miles. Oh, Emma, I don’t think you realize how badly we want to see the sheeps! Landscape Arch. Can you tell where a slab fell? Our first trail was at the far end of the park, so we enjoyed the drive out by obsessively searching for sheep. 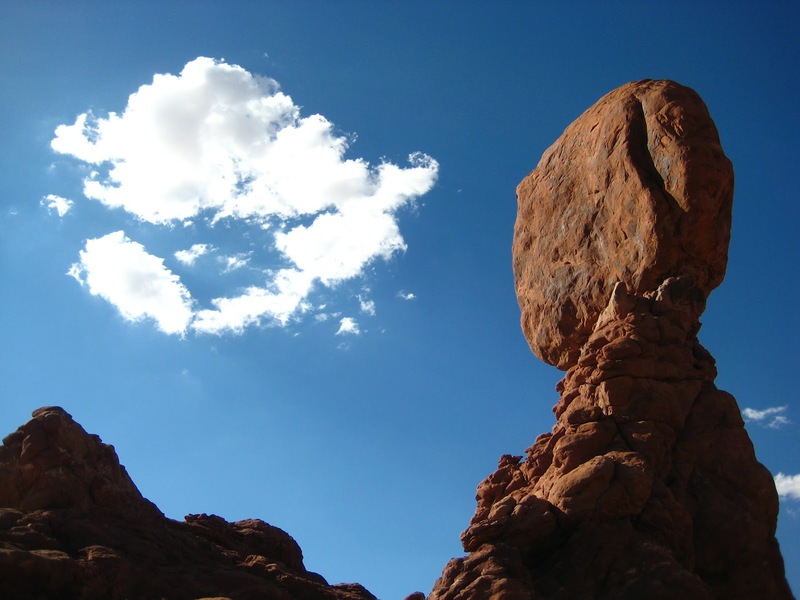 Devils Garden is a trail that may be enjoyed at several different difficulty levels. Many of the arches available for viewing are towards the beginning of the journey directly off the gravel path. You may go as far as Landscape Arch, the longest in the park, before the primitive loop begins. Here, we were soon traversing and scrambling over rocks and ridges. Rachel’s choice of wearing a hiking dress that day was nearly a poor one, but she managed to stay decent. The crowd thinned as we encountered more and more arches and more and more difficult pathways. The rock cairns I explained yesterday were especially helpful on this terrain, and they often kept us on the right route. We’d started off on the trail in the mid-morning hours, and were able to enjoy the cooler morning temperatures for some time. However, the desert is good at heating up once the sun is comfortable high in the sky. We aren’t ones to disregard park warnings, so we were well equipped with our water bladders in our packs, each holding 3 liters of water. When we reached the end of the trail we were more than happy to have a rest and picnic in the limited shade we could find. Dark Angel looked over us as we munched our sammies and snacks. Then, once more, we were in the sun hiking back. Our second wind was more of a sweltering breeze due to the heat, and we were soon grateful to stand in whatever shady patch we could find. Despite the liters of water consumed, our hands were still swollen slightly by the time we reached the main trail again, a sure sign of the start of dehydration. The trail head and accompanying water supply were a welcoming sight. Balanced rock being all balanced and such. We had plenty of time to spare before we needed to head out towards Delicate Arch for sunset and little desire to stay in the sun for much longer and, so, set out to find a place with shade to rest, write, and snack. The picnic area across from Balanced Rock proved to be just the place for all of our needs. While most of the tables were in the blistering sun, we managed to score one with a lovely tree bending over to protect us with its shade. I tried to write some informative words for you, oh readers, but Rachel’s napping just looked so peaceful and I knew I wanted to join. Rachel, once again saving me from certain cancerous doom. To recover from our slumber, we got after some hummus with pita chips in a completely unladylike manner. But, it did the trick and we were soon back on the trails where we explored the mini loop around Balanced Rock before setting off for the Delicate Arch trail head. We had plenty of time to meander along the route to the most famous of all arches in the park. We encountered the homestead of the first settler in the area. An Ohio man, who escaped to the West for the drying, presumed healthier, climate. He built a teensy one room home for himself and his son. Later, when his daughter and her family joined them, he built a proper house with wood floors and everything. It was still teensy and perhaps had just slightly more space for the 4+ people than Rachel had when she lived in my laundry room senior year of college. Teeny tiny. Continuing once more, ever closer to the final destination, we came upon what Rachel holds among her top 10 favorite things she’s ever seen. Petroglyphs on a rock above the trail. Perhaps as old as 400 years, these markings revealed horseback Ute Native Americans hunting bighorn sheep. Small dog like creatures were also included. We were really impressed with the lasting power of the art and we walking on finally, still wondering about the markings that didn’t last the years and the individual who had sat there so long ago patiently carving the scene. After some unexpectedly steep uphill climbs, we finally turned a corner and were presented with a sight we’d only seen in photographs, postcards, and nature documentaries. Delicate Arch. We’d arrived early enough to get a decent spot among the droves of people with the same sunset plans we had. It did, however, prove difficult to get a shot of the arch without a group of ridiculously posed tourists. The line of groups and families waiting to get that perfect picture under the arch seemed never ending, and if any stayed too long blocking the shots of other photographers wanting that solitary shot of the majestic arch, they were requested in no polite tones to move along. We had both expected the sun to set behind the arch, however it actually slunk away behind our backs, drawing the shadows up over the arch from the bottom. Still a wonderful sight to behold. Several adventurous young sightseers took in the view from atop the nearby rock formations. The darkness grew, yet we stayed behind to enjoy the desert night. We were well prepared with jackets and headlamps, so felt no anxiety towards the upcoming night hike back to our vehicle. The darkness welcomed us and we welcomed the sounds and sights of the nocturnal wildlife, awaking with the moon. We kept a slow pace so that everyone could pass us and take their noises with them. It’s always good to hear people enjoying the natural beauty of the parks, however many do not realize that the show is not over. It’s just starting. Once the night air was empty of these sounds, it began to offer up its own. We chose a spot on a small bridge over a pool of water. Day or night, water is a great place to find wildlife. We waited. It was not long until we were rewarded with the sounds of bullfrogs calling to potential mates, the flapping of bat wings as they whiz by us, and various insects chirping and humming. We listened and watched the stars come out before we said our final goodbyes to the park. I don’t know if I’m in love with the desert yet. It’s still hot and often times not as elaborate or as colorful as Arches. Maybe I’m a little in love with shade in the desert, and that counts. What is your favorite type of landscape?